I have 2 ovens. The top one is convection. Edit: senior moment. Please disregard. Well...I guess there's no way around it. Appollyon wrote: I look at Carvins on eBay all the time, but as I'm looking at the price I'm always thinking to myself: "hmm... ...for just a bit more, I can get a custom Carvin and that's the beauty of the company." +1...and you don't have to worry about false advertising (unreported damage) AND you have the advantage of the 10 day return. Well, usually; seems I find more and more non-returnable Opt 50s I want. I suppose I just joined this club tonight. I had placed an order for a PB5J (hog body in vintage yellow metallic w/ satin matte, flamed maple fretboard) in late Oct. I had been seriously eyeing that passive tung-oiled PB5 that had the red tortoise pickguard and rosewood fretboard in the GIS section here recently. Then out-of-the-blue I get a customer appreciation coupon which just sweetened the deal enough for me to jump on it and I ordered that passive PB5 (notice it's no longer listed in the GIS). The GIS PB5 be arriving some time around the end of this week. 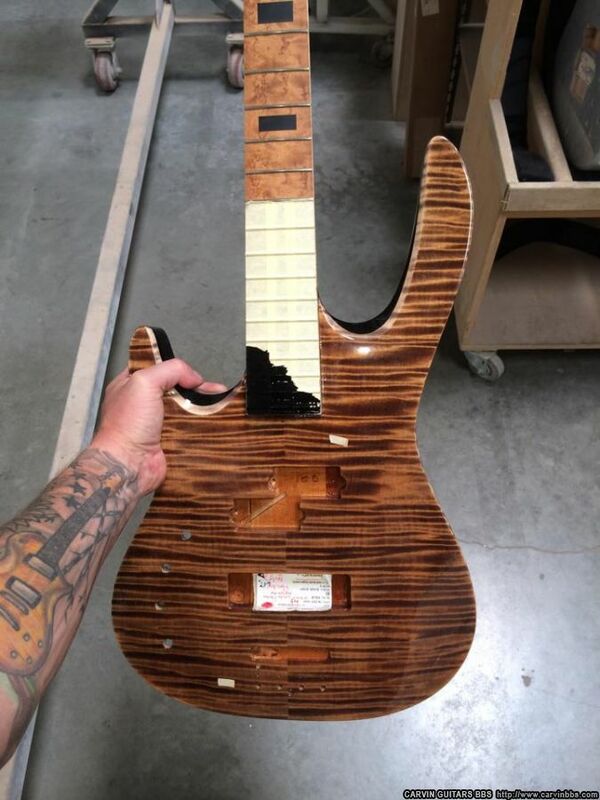 The other PB5 I custom ordered should be arriving around Christmas time. mbardu wrote: Well...I guess there's no way around it. I currently have two Bolts being built. One is white/white, the other is surf green. both with reverse inline headstocks, maple boards, stainless steel jumbo frets. The white one is maple body with an M22SD in the bridge; the surf green is alder with a C22B in the bridge. both with chrome hardware and fixed bridge. They are slated to be done at the end of this month. I'm ready! Two in the oven - completion date is 9/25. In 2003, I ordered a Bolt and a B4F on the same day. 2004 I had a BB75PF and a DC747 where the build times overlapped. 2012 I ordered a B40 and a B40F about a week apart. Don't know if this counts, but this year I ordered an amp and cabs in one of the optional colors while my C66 was being built. Last edited by mgood on Wed Aug 06, 2014 2:58 am, edited 1 time in total. Had my Kiesel, moss scb7 and DC7X all in the oven recently. Now I have my DC7X and "ultra-bolt" in the oven. JCG wrote: Two in the oven - completion date is 9/25. This one makes it 3 in the oven. MODEL: DC600 (completion date is 10/31/14). Thanks gumbynotpokey for the heads up about this club! Two buns: CL450 and DC145M currently on order. I sorta feel like I'm cheating though. The CL is from the GIS, so it's like one in the oven, one in the microwave. I waited to pull the trigger on my second bass until my first arrived, but I did order the second one during my 10-day checkout of the PB4. Not sure it counts, but close!! Waiting on 2 Ultra V's...first one is due to be completed on 6/12, and Chris told me the other day it was just about done. The second one I'm expecting sometime in the latter half of July. The Bolt Plus, ordered 5/31, is ready to ship today. The Kiesel team is just kicking them out! Last edited by JCG on Wed Jul 01, 2015 5:28 pm, edited 1 time in total. Looking forward to the teal burst. KM8 and AM6 ordered 1/29.